It is increasingly recognised that the immune and nervous systems are closely integrated to optimise defence systems within the lung. In this commentary, the contribution of various neuropeptides such as substance P, calcitonin gene-related peptide, vasoactive intestinal peptide and somatostatin to the regulation of T cell activation is discussed. These neuropeptides are released not only from nerve endings but also from inflammatory immune cells such as monocytes, dendritic cells, eosinophils and mast cells. On release they can exert both direct stimulatory and inhibitory effects on T cell activation and also indirect effects through their influence on the recruitment and activation of professional antigen-presenting dendritic cells. Neuropeptides should therefore be included in the conceptual framework of the immune regulation of T cell function by dendritic cells. Homeostasis within the body is regulated by three interwoven systems: the endocrine, nervous and immune systems . It is increasingly clear that exchange of information between these systems is facilitated by the endocrine and/or paracrine release of hormones, neuromediators and cytokines by either of these systems and by the shared expression of reciprocal receptors for these mediators. As an example, T lymphocytes express neuropeptide receptors for substance P (SP), calcitonin gene-related peptide (CGRP), somatostatin and vasoactive intestinal peptide (VIP). These neuropeptides are released from the unmyelinated nerve endings within the central lymphoid organs and peripheral tissues. At the same time, neural cells express receptors for cytokines, which are released from the immune system in a paracrine fashion and affect neural growth and differentiation. To complicate things further, immune cells themselves can produce neuropeptides, which influence nervous or immune cells in a paracrine or autocrine fashion. In this commentary the pivotal role of neuropeptides in the process of T cell activation is discussed against the currently prevailing paradigm of T cell activation by professional antigen-presenting dendritic cells (DCs) . In this paradigm, the first step in the adaptive immune response of the T cell is the recognition and uptake of antigen by immature DCs derived from bone marrow that reside in the periphery of the body and the marginal zone of the spleen, followed by processing of the antigen into an MHC-associated peptide that can be recognised by the T cell receptor (TCR). DCs are professional antigen-presenting cells for three reasons. First, they express many pattern-recognition receptors for foreign antigen and have the necessary intracellular enzymes to degrade the antigen into immunogenic peptides. Second, an encounter with 'dangerous' antigens induces the functional maturation of DCs and their migration into the T cell area of draining lymph nodes and spleen, carrying the antigenic cargo into the sites of T cell recirculation. Third, when mature DCs have reached the draining lymph node and spleen, they express co-stimulatory molecules such as CD80, CD86 and intercellular cell-adhesion molecule-1 (ICAM-1) (which are necessary for optimal T cell activation and the avoidance of T cell anergy), and produce cytokines such as interleukin (IL)-12 and IL-10 that critically determine the type of T helper response that is induced . By performing these three essential functions, DCs are the only antigen-presenting cells that can induce a primary immune response after transfer into unimmunized mice, whereas B cells and macrophages fail to do so. Any discussion on the role of neuropeptides on T cell activation should therefore take into account not only the direct effects of these mediators on T cells but also their indirect effects through the modulation of DC function. Direct interactions between neuropeptides and immune cells are facilitated by the well-known innervation of both primary (thymus and bone marrow) and secondary (spleen, lymph nodes, Peyer's patches, tonsils) lymphoid organs by capsaicin-sensitive nonadrenergic and noncholinergic (NANC) primary afferent nerve endings and by autonomic nerves containing VIP, somatostatin and neuropeptide Y [4,5,6]. Within these secondary immune organs, SP and CGRP containing afferent nerve endings of the NANC system terminate around high endothelial venules, the sites of specialised extravasation of recirculating T cells, and in the T cell area and lymphoid follicles, interacting with T cells, macrophages, mast cells and possibly DCs [6,7]. Outside the immune system, the direct interaction of nerve endings containing SP and CGRP with DCs has been described in the skin and in the airway epithelium [8,9]. Within these tissues, the long surface extensions of DCs run parallel to the extensive network of unmyelinated nerve endings, making interaction very likely . Although immunohistochemical staining of thymus, spleen and lymph nodes has demonstrated that neuropeptides such as SP are confined mainly to unmyelinated nerve endings , non-neuronal cells of the immune system can be a source of tachykinins . Human T lymphocytes contain preprotachykinin-A mRNA, encoding SP, and produce endogenous SP . Human and rodent monocytes and macrophages produce SP under baseline conditions [13,14,15]. More importantly, murine DCs derived from bone marrow were shown to contain mRNA for the preprotachykinin A gene, and transcription was confirmed by the demonstration of SP by ELISA and immunohistochemistry . On activation with lipopolysaccharide in vitro there was a marked increase in SP expression by mononuclear phagocytes and DCs [13,14,16]. The expression of neuropeptides by these various immune cells could be an explanation of why not all immunoreactivity for neuropeptides is confined to nerve endings within secondary immune organs. During the effector immune response, the process of lymphocyte migration also allows T cells to migrate into inflammatory lesions within non-lymphoid organs such as the skin, gut, joint and lung. In these sites, lymphocyte extravasation is facilitated by neurogenic inflammation and plasma extravasation that is dependent on the release of SP from capsaicin-sensitive primary afferent nerve endings via an axon reflex. In a mouse model of delayed-type hypersensitivity inflammation of the lung parenchyma, it was shown that SP and VIP were released extensively (nanomolar concentration range) into the lung parenchyma after challenge with sheep erythrocytes in sensitised mice, and closely followed the kinetics of increase in lymphocytes, granulocytes and macrophages in bronchoalveolar lavage fluid as well as the production of cytokines. During the induction of inflammation there was an increase in SP immunoreactive nerve endings within the peribronchial and perivascular leukocytic infiltrates . Not only are inflammatory areas richly supplied by NANC neurons, they also contain many inflammatory immune cells, known to produce neuropeptides (namely macrophages, DCs and lymphocytes). Eosinophils, extracted from Schistosoma mansoni-induced liver granulomas, have been shown to produce SP that can influence interferon-γ (IFN-γ) production by intralesional T lymphocytes [18,19]. The same granulomatous lesions also contain immunoreactive somatostatin and VIP . Sites of inflammation within the lung are therefore potentially important areas of interaction between effector immune cells and locally released neuropeptides. The NANC nervous system acts through neuropeptide mediators such as the tachykinins SP, neurokinin A and neurokinin B. There are at least three distinct tachykinin receptors: neurokinin-1 receptor (NK-1R), NK-2R and NK-3R, which bind preferentially to SP, neurokinin A and neurokinin B, respectively . SP is the most widely studied member of the tachykinin family and modulates a number of important immunological functions, among which are direct effects on T cell activation. Physiological concentrations of exogenously added SP (10-11 to 10-13 M) augment antigen- and mitogen-induced production of IL-2 [21,22] and proliferation in T lymphocytes in vitro and in vivo [23,24,25]. After administration of SP to normal and neonatal capsaicin-treated rats, there was an increase in concanavalin A-induced proliferation of spleen and peripheral blood lymphocytes, which correlated with an enhanced production of IL-2 and expression of the IL-2R, CD25, on CD4+ T cells. Moreover, SP markedly enhanced the percentage of circulating CD25+ CD4+ T cells in the peripheral blood . Another well-known effect of SP is the stimulation of IFN-γ production by T cells, an effect that could be due to enhanced IL-12 production by antigen-presenting cell types [19,27,28]. With few exceptions, the immunomodulatory effects of SP on lymphocytes can be inhibited by pharmacological antagonists of NK-1R such as the non-peptide antagonist SR140333 [22,26]. Moreover, biochemical and molecular evidence has been obtained that human [12,29,30] and murine lymphocytes [18,31] express NK-1R but not NK-2R or NK-3R. Human monocytes were also shown to contain NK-1R, particularly when obtained from lamina propria of mucosal tissues . Lung and skin DCs also contain binding sites for SP, most probably NK-1R . The demonstration that most immunocytes (monocytes, DCs and lymphocytes) producing SP also express its receptor led to the hypothesis that SP not only acts as a mediator of the crosstalk between the nervous and immune systems but is also biologically involved in the direct interaction between immune cells in a paracrine and/or autocrine fashion, independently of sensory nerves or neurogenic inflammation [12,14,16]. Because DCs are highly involved in the induction and regulation of many immune responses, we have examined the endogenous expression of SP by DCs and studied its role in the activation of T lymphocytes. On co-culture of DCs and allogeneic or syngeneic ovalbumin-specific T cells the addition of a specific NK-1R antagonist, SR140333, led to a decrease in T lymphocyte proliferation induced by DCs, an effect that was enhanced when blocking the co-stimulatory CD80/86-CD28 pathway. These findings were confirmed by the use of responder T cells derived from NK-1R knockout animals, ruling out any toxic effects of SR140333 on the observed effects. Moreover, when purified naive NK-1R –/– T cells were stimulated with stimulatory anti-TCR and anti-CD28 antibodies in the absence of DCs, there was a decrease in T cell proliferation, revealing the autocrine release of stimulatory SP by T cells themselves . Indeed, T cells have been shown to transcribe the mRNA for preprotachykinin A and release SP on activation with capsaicin . From a number of experiments, direct autocrine and/or paracrine effects of endogenously released SP on the immunostimulatory capacity of DCs seem less likely, although it has been shown that SP induces activation of the transcription factor nuclear factor-κB in murine DCs [9,16,33]. This transcription factor was previously shown to be pivotal in the upregulation of stimulatory activity in DCs by upregulating the expression of MHC class II, the co-stimulatory molecules CD86 and CD80, and levels of IL-12 production . One way in which SP might enhance T cell responses is by recruiting DCs into sites of damage, when it is released very rapidly from nerve endings. SP is a chemoattractant for lung-derived DCs in vitro and in vivo, and in this way it might stimulate the primary immune response by enhancing immune recognition of dangerous antigens. Moreover, SP is implied in the recruitment of DCs into sites of inflammation during secondary T cell responses in the lung and skin, and its depletion leads to severely reduced delayed hypersensitivity reactions . It is currently unclear how DCs regulate the release and activity of SP during interaction with T cells, but one interesting study demonstrated the presence of aminopeptidase N on the surface of bronchial mucosal L25+ DCs in patients with asthma. This enzyme has the potential to break down SP . CGRP is released simultaneously with SP from capsaicin-sensitive nerve endings. In contrast with SP, CGRP directly suppresses IL-2 production and proliferation in murine T cells . In addition, CGRP-containing nerve endings are found in close proximity to skin Langerhans cells, and CGRP has several suppressive effects on DC activation [8,37]. Pretreatment of murine skin DCs with CGRP led to a decrease in alloresponses in the mixed lymphocyte reaction, as well as a decrease in ovalbumin-specific T cell responses of syngeneic T cells . The mechanism by which CGRP mediates its effects on DCs is slowly being discovered. Signalling via the type I CGRP receptor expressed on human monocyte-derived DCs and long-lived murine DC cell lines leads to an increase in intracellular free Ca2+ and to a decreased expression of MHC class II, the co-stimulatory molecule CD86, and to a decreased production of IL-12, an effect that could be due to an enhanced production of IL-10 by these DCs [37,38]. Somatostatin is a widespread neuropeptide with generally inhibitory function on hormone release in the anterior pituitary and the gastrointestinal system (for extensive review and references see ). In the peripheral nervous system it is found in sympathetic and sensory neurons innervating the lymphoid organs, and receptors for somatostatin are located predominantly in lymphoid follicle germinal centres . Additional non-neuronal sources of somatostatin (such as granuloma cells within Schistosoma-induced liver granulomata, lymphocytes, macrophages and thymic DCs) have been described. The presence of binding sites for somatostatin and the expression of mRNA for somatostatin receptors (sstr1-5) on lymphocytes and monocytes is established, although the expression of a particular somatostatin receptor subtype on T lymphocytes seems to vary with species and with the origins of the T cells. Somatostatin is generally inhibitory for T cell proliferation, especially in the presence of suboptimal stimulatory conditions. Indeed, the administration of antisense oligodeoxynucleotides designed to block the translation of somatostatin leads to an enhanced spontaneous proliferation of rat splenocytes in vitro . In addition, somatostatin suppresses the production of IFN-γ from murine and human T lymphocytes, a finding that has deserved the most attention within the granulomatous inflammation induced by Schistosoma, where it generally antagonises the stimulatory effects of SP and vice versa [20,27]. Similarly, granulomata of sarcoidosis patients have been known to bind the somatostatin receptor ligand octreotide in vivo . The precise contribution of somatostatin to the immunostimulatory function of DCs remains to be determined, although certain DC subsets contain immunoreactive somatostatin. VIP and the structurally related pituitary adenylate cyclase-activating polypeptide (PACAP) are present within immune microenvironments and inflammatory pulmonary lesions and modulate a number of T lymphocyte functions (; for review and references see ). Macrophages and lymphocytes themselves produce VIP. Receptors for VIP are located predominantly at the CD3+ T cell area in lymph nodes and spleen, and include the VPAC1 receptor (also known as PACAP type II/VIP1) and VPAC2 receptor (PACAP type III/VIP2) . Although VIP has been known to be a suppressive neuropeptide for T cell proliferation and production of IL-2, IL-4 and IL-10, as well as an anti-inflammatory mediator, there are a number of recent studies suggesting that VIP might have a dual role, also enhancing certain lymphocyte functions by interacting with different VIP receptors [42,43]. VIP and PACAP inhibit the activation-induced cell death of activated T cells by inhibiting the expression of Fas ligand, possibly leading to a prolongation of immune responses . The stimulatory effects of VIP on T cell proliferation occurred specifically when stimulated by antigen-pulsed antigen-presenting cells, suggesting an indirect effect of VIP. By signalling through the VPAC1 receptor, VIP was shown to induce the maturation of immature DCs leading to an enhanced production of IL-12 and an enhanced expression of the DC-maturation marker CD83, especially in the presence of suboptimal amounts of tumour necrosis factor-α . Many recent studies have illustrated the importance of immune regulation by neuropeptides through direct effects on T cells and indirect effects on antigen-presenting DCs (see Fig. 1). The accumulated data also suggest that neuropeptides are biologically involved in the direct interaction between immune cells in a paracrine and/or autocrine fashion, independently of sensory nerves. These studies have largely used in vitro systems in which concentrations of neuropeptides could be outside the physiological range and in which no account was taken of the normal anatomical distribution of lymphocytes and neural innervation of lymphoid organs and peripheral tissues. Most models that have emerged from these studies have not integrated the effects of neuropeptides with those of cytokines or mediators released from inflammatory cells. For example, it is at present unclear whether and how neuropeptides can modulate such important functions as T helper cell differentiation, tolerance induction and lymphocyte migration. Clearly, studies in vivo on the role of neuropeptides will be facilitated by the use of pharmacological antagonists of neuropeptide receptors and of knockout mouse strains lacking particular neuropeptides or their receptors [16,17]. Ultimate proof of the contribution of neuropeptides to human T cell-mediated diseases awaits the results of clinical interventions with the newer and highly selective antagonists of the various neuropeptide receptors. 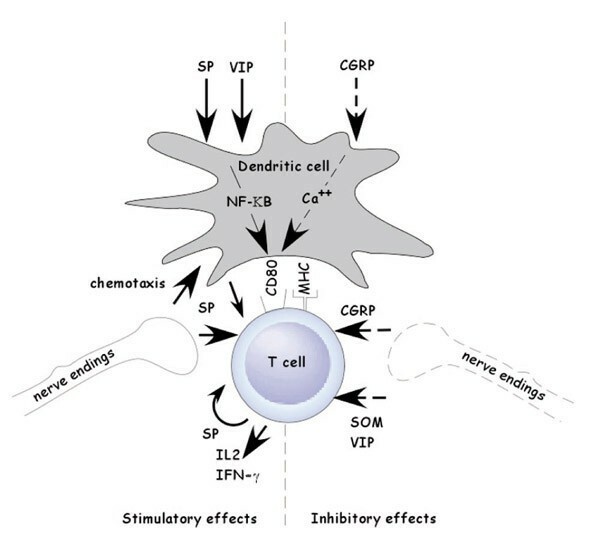 Summary of known effects of neuropeptides on the interaction between dendritic cells and T cells. Neuropeptides can be released from nerve endings innervating the primary or secondary lymphoid structures or from nerve endings within inflammatory lesions. Alternatively, dendritic cells and T cells can produce neuropeptides that influence immune activation and/or suppression in an autocrine and paracrine fashion. Solid arrows indicate stimulatory effects; broken arrows indicate inhibitory effects. CGRP, calcitonin gene-related peptide; IFN-γ, interferon-γ; IL, interleukin; NF-κB, nuclear factor-κB; SOM, somatostatin; SP, substance P; VIP, vasoactive intestinal peptide. Using nested PCR and monoclonal antibodies, it was very recently shown that human and murine DCs express NK-1R (Marriott I, Bost KL: J Neuroimmunol 2001, 114:131–141).